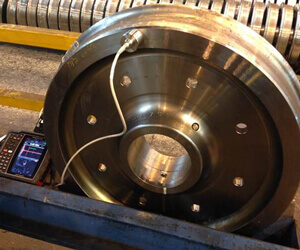 Custom and off-the-shelf applications for internal stress measurement on plates, train wheels, and thick structures using portable and integrated solutions. The technique uses two orthogonal linearly polarized Shear Horizontal waves at 0 and 90 degrees to provide a birefringence measurement that is directly correlated with internal stress. Innerspec’s Stress application can be installed on the PowerBox H providing a completely portable solution that can easily be used in the field and the factory floor. No couplant EMAT technique. Capable of penetrating surface coatings and corrosion. 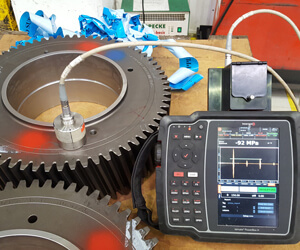 No beam steering errors caused by misalignment of the transducer with the surface. Stress readings in MPa or psi. Built-in reports with stress measurements, graphs, snapshots, and other data. Low-weight PowerBox H (<3Kgs) instrument option available. 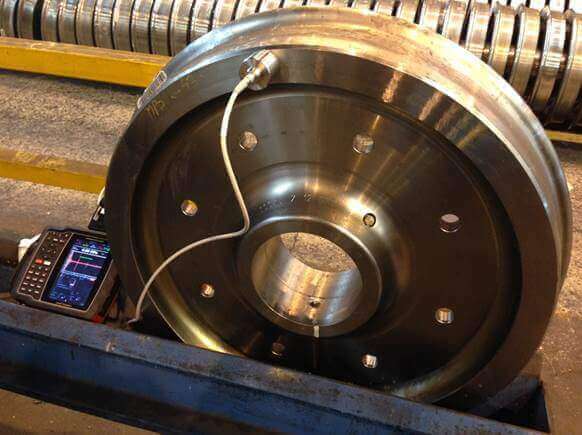 Portable probe scanner for semi-automated field measurements on train wheels. Meets EN 13262:2011 and German Standard VPI 09. Tested and endorsed by European OEMs for the railway industry. Integrated solution available (temate SM).